Uncharted Waters New Horizons for PC – WARNING: This is a very old PC executable that will only work well on older PC’s unless you are very experienced at running old PC games on modern hardware. If you are in doubt or can’t get it to work, then please download the SNES version above. Uncharted Waters 1 for PC – WARNING: This is a very old PC executable that will only work well on older PC’s unless you are very experienced at running old PC games on modern hardware. If you are in doubt or can’t get it to work, then please download the NES version above. Uncharted Waters 2 Patch Level – This level tool can be used to patch national friendship levels and fame ratings of your hero. There is no need to specify his/her name – the program will do it automatically. The tool is simple to use: give it a number of a game slot and some actions to do. Note: friendship level must be a decimal value between -100 and +100, and fame (rating) should be in a range of 0 to 50000. If you specify a number of out range, it will be adjusted! Uncharted Waters New Horizons Factsheet IMAGES – Special thanks to Fernando who sent me this almost comprehensive set of images from the game showing you what all the ships, mates, weapons, and items look like! Everything is included here except for 7 navigators, which he hopes to find soon. Great work Fernando! Uncharted Waters New Horizons Game Map – A large PNG image of the fully explored game map showing every port and discovery. Different icons are used to show what type of goods are sold at each port and how valuable the discovery is. 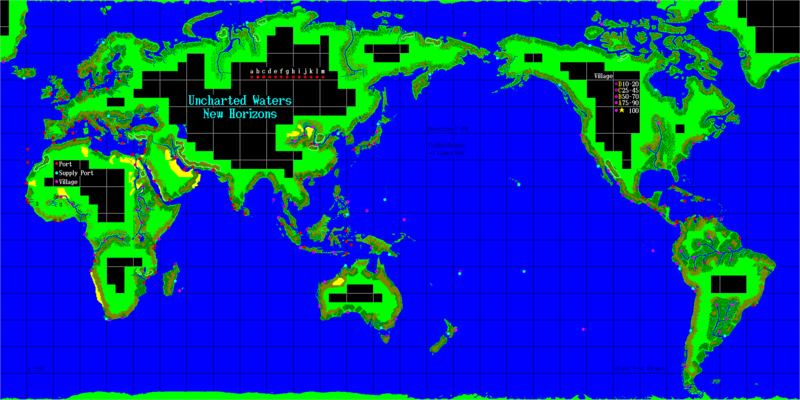 Many thanks to FatRatKnight at GameFAQs for this map!